This brochure developed by the Champlain Hospice Palliative Care Program provides information about supporting someone who is grieving. It includes tips on providing emotional support, social support and offering practical help. 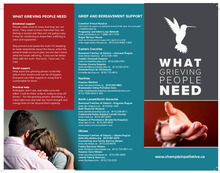 Download "What Grieving People Need Brochure_ENG-Bii edits.pdf"
If you are feeling stuck in your grief or worried about how your grief is going, you may want to talk with a trained professional who understands grief and bereavement.